Welcome to our April 2011 design newsletter! 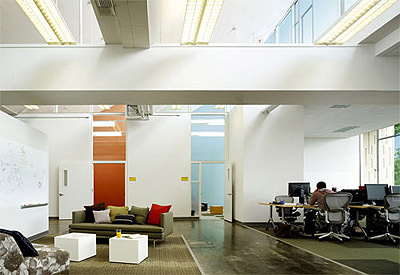 Are you about to move to a new office space or thinking about remodeling your current one? Today I'd like to share some trendy office design ideas from around the world! You will see what Facebook, Skype and even Twitter look like on the inside! Don’t forget to check out our Blog for other creative ideas on how to improve your business interior. 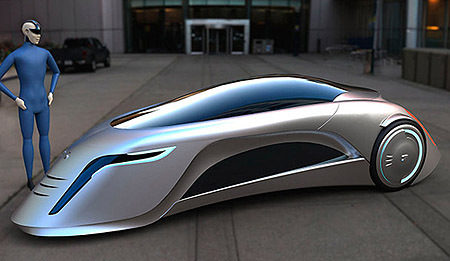 In our Green News corner, take a look at a new future car design. Not only it will be electric and achieve high speed, it will more likely look like a supersonic aircraft. In my May issue I will be talking about this year's trends in architecture and interior design, but today take a look what is trendy in office design around the globe. You may even see certain common characteristics in a design of famous companies. I hope today you will get inspired to do something creative in your office with the following ideas! In its Palo Alto, CA office Skype created a creative relaxed environment in addition to that "unfinished" look with exposed piping, plywood and concrete. 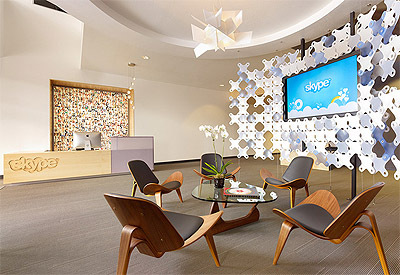 Skype’s office designers skillfully implemented Honeysuckle color of 2011 year for their carpeting and colorful furniture. To learn more and to see more images of Skype office design click HERE. Honeysuckle color carpet at the meeting room, Skype office in Palo Alto, CA. 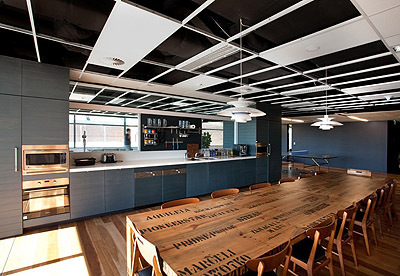 Lunch room table at Leo Burnett's office is made out of shipping boxes which creates an interesting contrast in overall design, Sidney, Australia. Creative people need creative spaces to collaborate and to produce their best work. This contemporary office is the bright example and it happen to be the legacy of Leo Burnett – one of the most known advertising company’s in history! (think of Marlboro man, Pillsbury doughboy, and Green Giant.) Their newly redesigned Sydney office was made to match the company’s values of community, creatively and efficiency, as well as to reflect the way a creative agency works and collaborates. 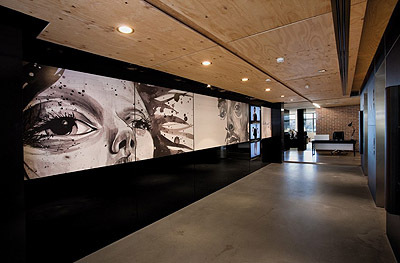 Visitors are welcomed to Leo Burnett office with giant wall art pieces which immediately create a bold statement of being serious about advertising business. Learn more about Leo Burnett's office design HERE. 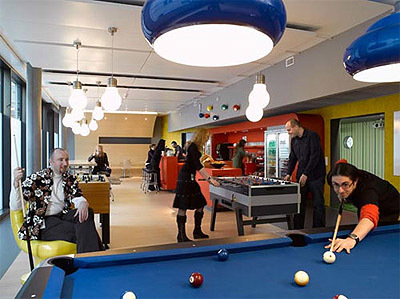 Google is a prime example of how interior design can turn even a boring environment for programming into a colorful playground for employees and visiting clients. They place emphasis on relaxation and convenience while providing employees with ways to feel like they’re not at work while they’re at the office. 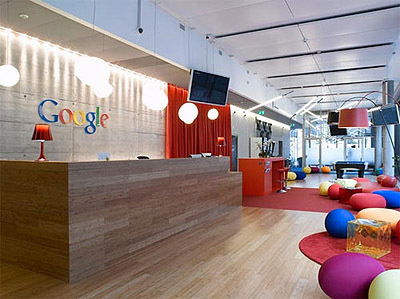 Google Office in Zurich, Switzerland - Lobby. Learn how to brand your business by interior HERE. 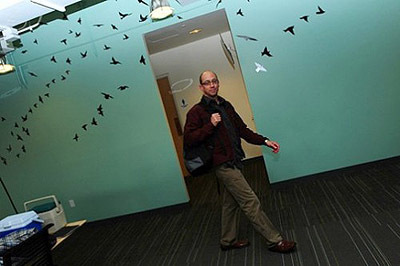 Most of us are on Twitter, but do you know what Twitter’s office look like? It’s located in San Francisco, CA and here are some pictures of the inside. The office collected plush sustainable furniture combined in a fantastic design ethics. The design theory was to create a fun sustainable space. All the walls are painted with VOC-free paints and all the selected furniture is non-toxic eco-friendly. The Twitter logo was made from reclaimed barn wood and hot rolled steel made by Lundberg Design. Recognizable bird motifs run throughout the whole office. A long concrete table in the conference room was made of 40% fly ash and 100% recycled aggregates. The base of the table and the receptionists’ desks are made from reclaimed barn wood as well. 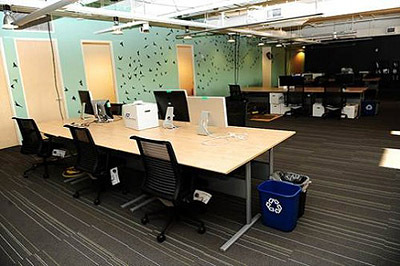 Learn more about Twitter's office HERE. 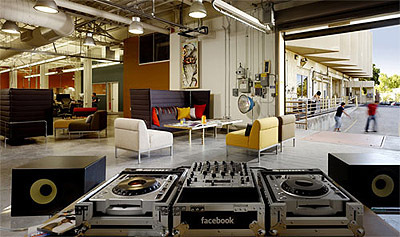 The new Facebook office is all about employees needs and wants. Several small ‘neighborhoods’ were created to give each department its own unique style. Employees are encouraged to write on walls, add artwork, and move furniture as they see fit. Who wouldn't want to work here? What will cars look like 10 years from now? Not only it will be electric and achieve high speed, it will more likely look like a supersonic aircraft. Here’s one award-winning vision of the future from Serbian designer Marko Lukovic, showing a three-wheeled electric car that’s packed with futuristic technology. Read more HERE.